We got up bright and early (no problem with constant daylight) and collected our little hire car from the city centre. A tiny bit of anxiety was lingering, we had read lots about how driving in Iceland can be nerve wracking with tricky roads and difficult conditions. 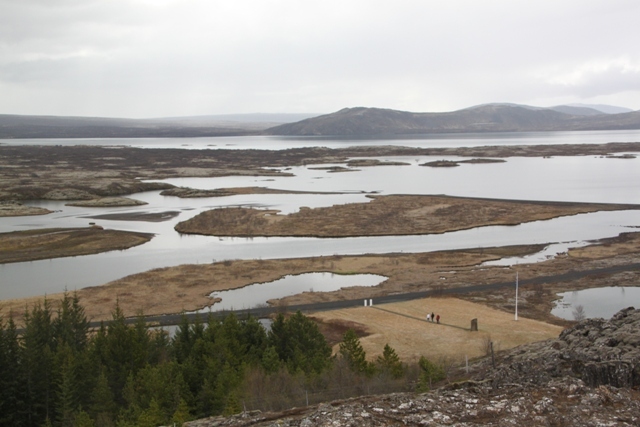 We plugged in our destination – Thingvellir – into the sat nav and were off. Within about 20 minutes we were out of the city, had left the main Route 1 and had the whole road to ourselves. We barely saw another car, it was amazing. This is the main road to the Golden Circle! Driving was also no problem at all – the roads at times were a little bumpy and a little gravelly, but nothing our little car couldn’t manage. It was lots of fun. The main issue was we had to keep stopping – the views were too beautiful to keep going. We passed lots of little farms, churches and rolling fields. Everywhere was framed by snow peaked mountains. 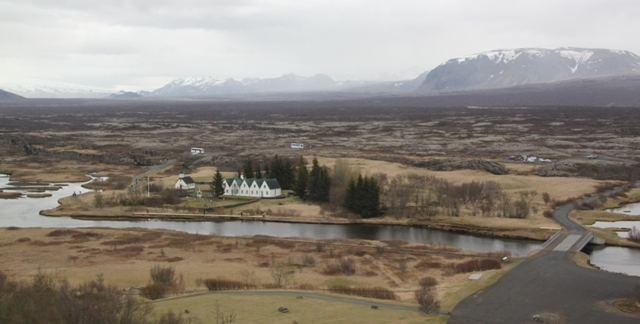 It takes about an hour to drive to Thingvellir from Reykjavik – photo stops meant it took us quite a bit longer. Just when we thought it couldn’t get any better, we glimpsed Thingvallavatn – Iceland’s largest lake and so still, calm and stunning. The water is unbelievably cold and unbelievably clear – pure glacial water, you can drink it straight from the lake. There is no pollution here. We sat on a picnic bench and just gazed at the scene before us. We loved the views of the lake, our 9 year old loved the field of stone piles there. 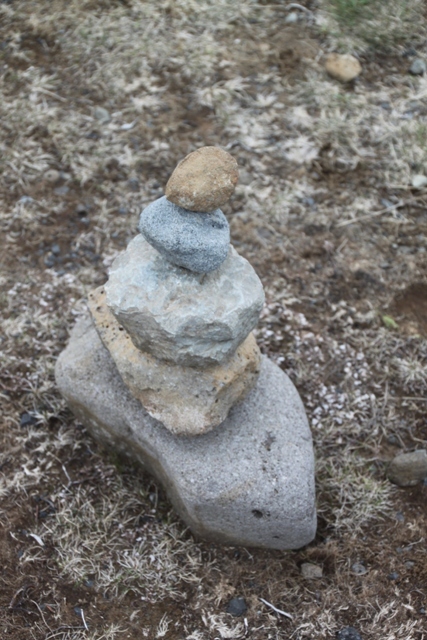 You see these stone piles everywhere driving around Iceland. He amused himself by making his own creations to leave behind. Thingvellir also did not disappoint. The car park was pretty full and there were a lot of curious tourists there. It is a UNESCO world heritage site, so you should probably expect that. It was Iceland’s first national park and is the most important historical site in the country. We had a quick look in the visitor’s centre – there is a small exhibition about the geology of the area. Interesting, but not interesting enough for our 9 year old who was keen to get exploring. 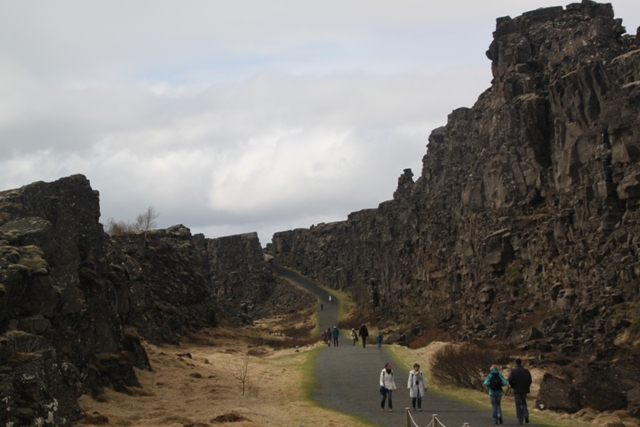 It is pretty awesome here – the place is right on the earth’s mid Atlantic ridge. 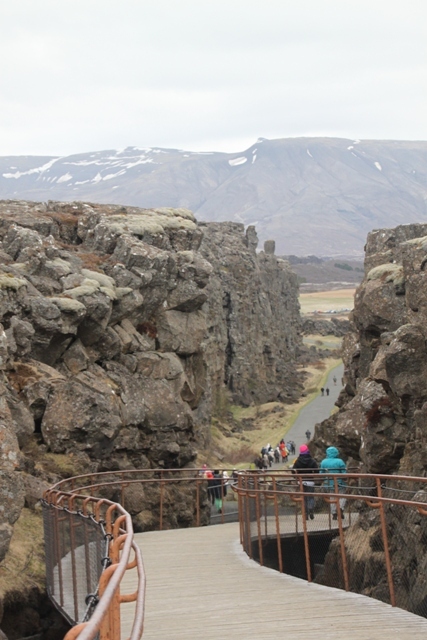 The Eurasian and American tectonic plates meet here and are splitting apart a few centimetres a year. This is the reason Iceland has such unique geological features. 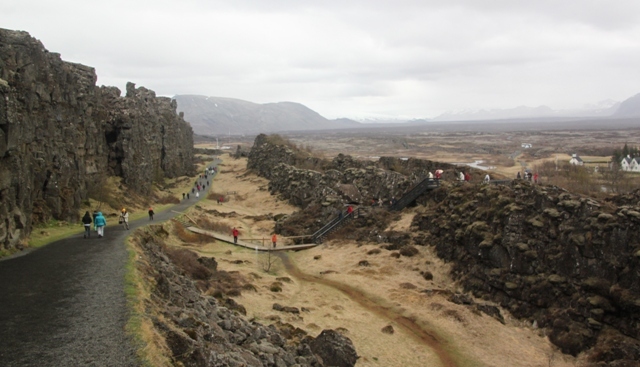 We walked along the footpath right down into the Almannagja fault – incredible. You walk right between the fault with either side of the plates looming above you. The 9 year old was half impressed, but he thought he was going to be able to look down a huge crack and throw stones into the centre of the earth’s core, so this was not quite that! 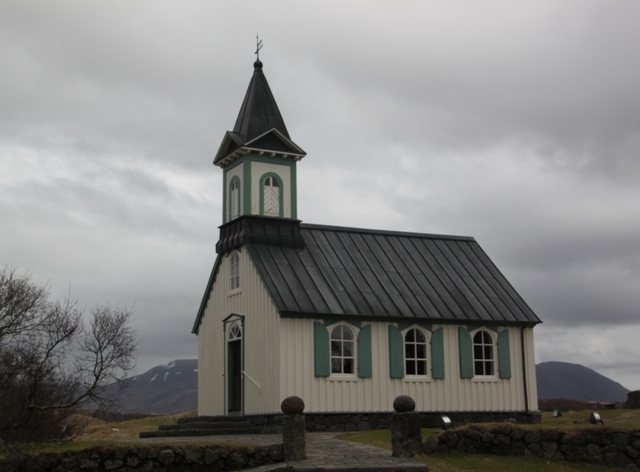 The Vikings also established the world’s first democratic parliament here in AD 930, and Iceland became a Christian nation at that time virtually overnight. 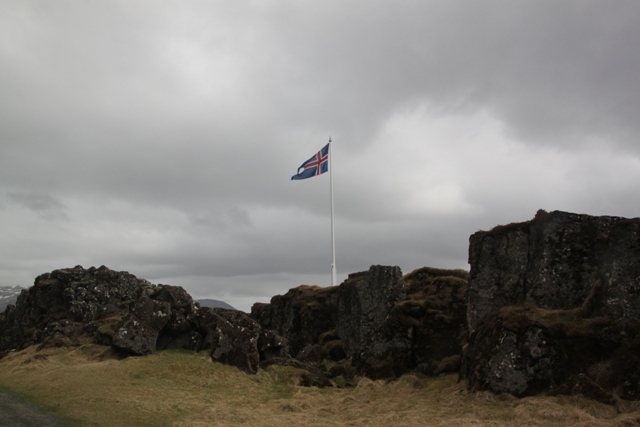 Obviously there are no historic buildings to mark this fact, but there is an Icelandic flag flying on the site of the Law Rock (or at least where they think it was). This was where the speaker of the law announced all the new rulings and answered any questions. We spent ages walking around, most of the coach parties just had a look at the fault, walked to the Law Rock and then back to their coaches. The area around the Law Rock and the main boardwalk is busy, but go a little further and peace and calm return. We explored all the walkways and crossed over to the little church on the other side of the water, which was built in 1859. The Prime Minister of Iceland apparently has his summer house here, but we couldn’t spot it. It was so beautiful, calm and peaceful here – Thingvellir is a very special place. 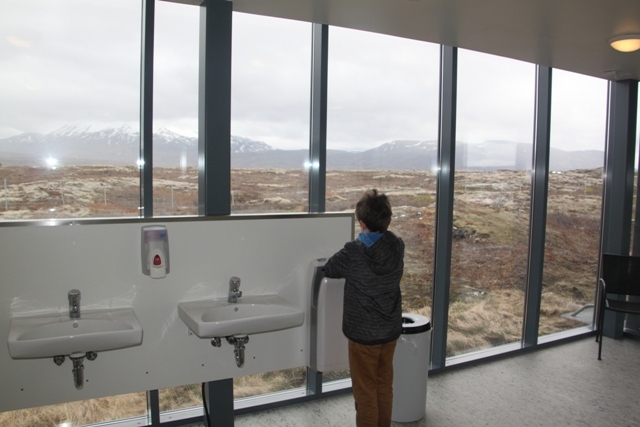 The 9 year old was equally impressed though with the “loos with a view” – you can wash your hands here and still soak up the scenery. Oh my! I’m getting excited! You will love it – Iceland is amazing. Hi 🙂 Thanks for liking my post. I have really enjoyed your posts about Iceland and I love your writing! Your posts are a pleasure to read and do the best job at portraying the place you are visiting. I will definitely be back to read more! Thank you for your kind comments!! We loved Iceland, such a great country to visit and then write about afterwards!